Tamarind pods come from the tamarind tree, which originally came from Africa, but can now be commonly found and used in the cuisine of, Asia, Arabia, Australia, Mexico, and South America. In Mexico and some other Latin American countries, it is called tamarindo. The sticky pulp of the brown pods is edible and has a sweet and sour flavor. It is used in dishes for a tangy component (such as in pad thai) and in chutneys, desserts, beverages, syrups, sauces, and candy. 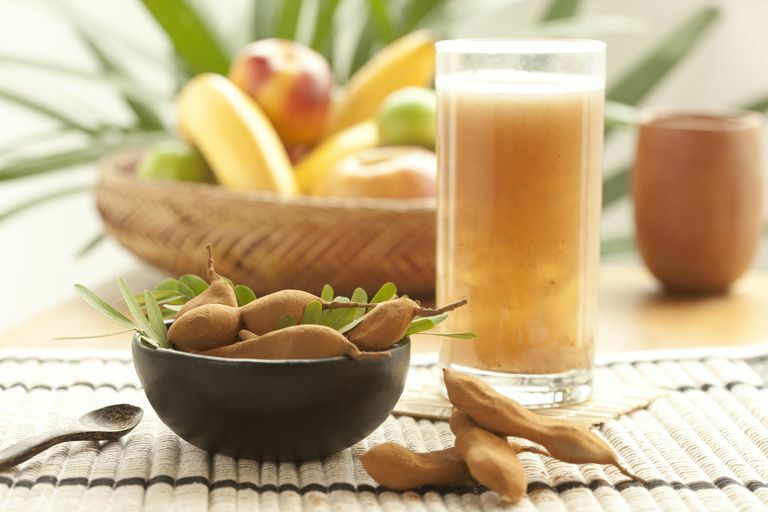 Tamarind has been a long-time folk remedy with a long list of uses, including treatment of sore throats and sunstroke. It may also have antibiotic and anti-inflammatory properties. Additionally, animal studies have shown that tamarind may have cholesterol and blood sugar lowering properties, but there doesn't seem to be a body of evidence in humans to confirm this theory. It's important to note that although tamarind has potential health benefits, it is a source of carbohydrates, and should be factored into a well-balanced diet. It is best eaten plain in small amounts or used as a condiment to spruce up the flavor of food and beverages. One-half cup of tamarind pulp contains roughly: 140 calories, 0.4 g fat, 38 g carbohydrate, 34 g sugar, 3 g fiber and 2 g of protein. Tamarind can be purchased in pod form or in a puree, paste, sauce, concentrate, or block. Many grocery stores stock it, and it can also be found in Indian and Asian markets. You can also order it online, in which case it will most likely ship frozen. Pure tamarind usually contains no added sugar or other ingredients, but always be sure to check the label. Tamarind is a popular ingredient in candy, drinks, syrup, and sauces, such as barbecue sauce—all of which can have added sugar. Tamarind paste will keep almost indefinitely in the refrigerator in a tightly closed container. The simplest way to enjoy tamarind is in the pod form. Break off the brown outer pod and remove the stringy part that looks like a small root wrapped around the pulp. You will be left with a long piece of pulp that has rock-hard seeds inside the size of large corn niblets. Cut it into sections and eat, nibble around the seeds and spit them out. Keep in mind too much can increase your blood sugars and may even have a laxative effect, so it's important not to overdo it.The tamarind sections can be put into a baggie or container for lunch or a snack. If you are looking for a meal with robust flavor, then try adding some tamarind to your dish. It pairs very well with spices, such as curry, ginger, and red pepper. Spicy fish with tamarind sauce is a great dish to try, or, if you don't care for fish, you can try grilled soy tamarind steaks. And for fresher, vegetarian fare, try this chopped kale and chickpea salad with tamarind vinaigrette. Your taste buds surely won't be disappointed. Sole, SS; Srinivasan BP, Akarte, AS. Anti-inflammatory action of Tamarind seeds reduces hyperglycemic excursion by repressing pancreatic β-cell damage and normalizing SREBP-1c concentration. Pharm Biol. 2013 Mar;51(3):350-60.